The Vatican Museums are ones ot the greatest museums in the world. They were founded by Pope Julius II in the 16th century, and from then started to collect an immense number of masterpieces. collect many important painting made by the best Italian Renaissant Artists like Leonardo da Vinci, Raphael, Giotto and Caravaggio. Famous all around the world for its frescoes, realized by Michelangelo (the ceiling with the famous The Last Judgement (1535–1541)), and other important Renaissance artists like Sandro Botticelli, Pietro Perugino and Pinturicchio. The 4 Raphael Rooms frescoes realized by Raphael, including the masterpiece: The School of Athens. Stanza dell'Incendio del Borgo ("The Room of the Fire in the Borgo"). The Vatican Museums are the most important Renaissance Art landmark in Rome. Every year, more than 4 millions of people visit the Vatican Museums. 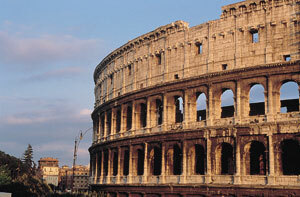 Once in Rome you can't miss the occasion to visit them! Opening Times: Sundays closed except for the last Sunday of each month; when admittance to the museums is free. Tour of the Vatican Museum and St Peter's Basilica with a small group. With this tour you will skip the line, entering before the general public step foot inside! Groups never exceed 10 people in total. The museum contains masterpieces and treasures. You will visit with a guide the 2000 rooms that stretch over almost nine miles, and share the stories and secrets contained within the Vatican's walls. Highlights of the visit will be: Michelangelo's famous Creation of Adam fresco in the Sistine Chapel, Raphael's Rooms. Michelangelo's masterpieces, La Pieta, in St Peter's Basilica. At the end of the tour you will stop to admire magnificent St Peter's Square, as your guide points out Bernini's ingenious use of optical illusion. During some season (generally from May to July and from September to October) is possible to have the tour at night. 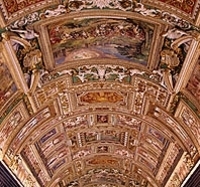 The Vatican Museums Under the Stars is accessible only with a guided tour. If you prefer you can book the ticket to visit it by yourself.